A woman walks past messages attached to a wall near the scene of an attack next to Finsbury Park Mosque, in north London, June 20, 2017. 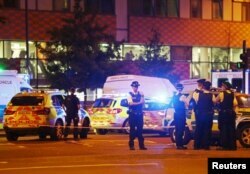 One person died and at least 11 were injured when 47-year-old Darren Osborne from Wales drove his van into a crowd of worshippers, reportedly shouting, "I want to kill all Muslims." He was pulled from the vehicle and held by members of the public until police arrived. Police officers attend to the scene after a vehicle collided with pedestrians in the Finsbury Park neighborhood of North London, Britain, June 19, 2017. 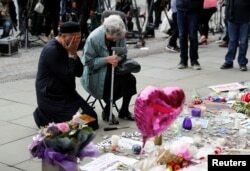 FILE - A Jewish woman named Renee Rachel Black and a Muslim man named Sadiq Patel react next to floral tributes in St Ann's Square in Manchester, May 24, 2017. Britain's opposition Labour Party leader, Jeremy Corbyn, meets local people in Finsbury Park Mosque, near the scene of an attack, in London, Britain, June 19, 2017.